The Sun shares accomplishment – union of your intelligence and your spontaneous wisdom – intuition. The wisdom of a heart which contains no “doubt” and is void of the desire to control or dominate. The knowledge that the “source” of your knowledge and power is not “you” – that the source influences you and fills you, but its origin is not in you. You must remain silently concentrated so that this relationship can develop and gain intensity and clarity to become fully conscious. Revelation moves and teaches, it guides you – it is the “gift” of believing without any support from without or within. Continue to endeavor now to advance from the “understanding of intuition” to the use of it. Regardless of your present circumstances, the adversity will be overcome – wholeness and harmony will prevail and there will be joy and happiness in your future. Opportunity is in the offing, do not hesitate to move forward – go ahead, there will be many blessings – this is a time to be happy and give thanks. Success lies ahead – growth of personal wealth as new ventures prosper. You have come through the hardships and will be blessed with new beginnings and liberation. Plan carefully for the future – obstacles can be easily overcome now – love and marriage will be very happy. During periods of stress – your consciousness falls back to the “source” of its being. Say “yes” to yourself and the life you lead – accept the unique individuality of your body, mind and spirit. Begin to bridge your beliefs, fulfill your abilities and reconcile all parts of your self. The result of consciously accepting life-giving beliefs is the recognition of the integrity of your own being – the joyful release after the test. Bring your “inner” light into consciousness and you experience a bright mind, a warm heart, an active body and a fiery spirit. Justice requires “action” in response to the knowledge gained about yourself. The Hanged man teaches you to remain passive, for the Moon requires passive surrender since there is no way to control the visions rising with its influence. The Sun is an active, energized state – by accepting the Moon’s fearful images you bring the energy outside of yourself and give all life radiance. Everything becomes simple, joyous and physical as the light of the unconscious is brought into daily life and the conscious and unconscious are joined together. Successful passage from the Tower gives you a childlike simplicity. The transfer happens all at once – a blinding revelation of the Tower, the inner radiance of the Star and the acute fear of the Moon are all join in a single instant of transformation and the aftermath is joy – a sense of all life and all the world being filled with wondrous light. Enlightenment bears the same characteristics in all people, it is an experience – not an idea. You feel struck by a burst of light and suddenly the world is seen or felt as spiritual and eternal rather than a day to day existence of drudgery and confusion. You feel totally alive with a childlike joy that most children never really know – for you have gone beyond your childish fear of darkness by traveling through it. The Sun represents knowledge. You feel a sense of wisdom, seeing everything with total clarity – clear and direct as you are “filled with the light of understanding.” You see everything as alive and holy, united through the light that fills all existence – unified and alive. You experience a burst of freedom as you are liberated from the ordinary restricted consciousness to openness and freedom. You feel a part of the whole rather than an isolated individual and you see the world in a new way. You experience joy, happiness and great beauty as you experience optimism, energy and wonder. Here is your nineteenth stop. Things are bright and clear in the Physical/Material Plane. The four aspects of the personality have been balanced and are healthy and functioning well. Realization of physical and material goals. Identification with the Earth, her products and offspring. Harmony with Nature. Productivity. Preparedness. Abundance. Physical perfection. Approaching the sense of atonement with the world/universe. There is a growing awareness of God in all material things, and materiality takes on a very spiritual sense for you. Life can seem to move in slow motion as you extract the nuances of pleasure from each minute you are awake. Split personality limitations are left far behind. The dispelling of fears, casting away of shadows. The power of conscious awareness to dispel darkness and fear. There is a physical urging toward even greater consciousness. Your physical conditioning pushes you forward; there is momentum. Your body is confident; you have faith in yourself. Here we will see happiness. Here there is victory. What have you birthed or brought to fruition? In the first position: This is the personality born to a life of active participation, with as much time spent out of doors as possible. You are drawn to fields in which there is much visible growth, productivity, and beneficial results. In the second position: The Sun has been achieved and stands behind you and with you as a ball of energy to help with your physical chores. In the third position – Now is the time for you to concentrate on the blessings of health and welfare in the material plane. Many gates are opening and it is for you to chose. It is proper for you to determine what you want and to ask for it. Otherwise, Santa Claus will just pick something at random from his bag of goodies. Think positive, you will be amazed at what is possible now. In the fourth position: This passion is for life, for all things living, for people, animals, plants, for creation itself. In the fifth position: You are upbeat and using your mind well, with proper use of intellect to help maximize efficiency at all levels. Good use of creative visualization, mind control, positive thinking, and the like. Energetic about present plans. You are correct in your evaluation of your karmic purpose and have chosen appropriate goals. In the sixth position: Here comes the sun. This will test how your Emotional Plane handles the good stuff. What will your heart do when everything goes right? Can your recognize and maximize good fortune? 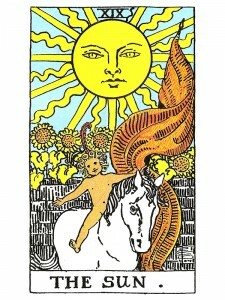 In the seventh position: Here the sun shines brightly on your mental affairs. If you are ahead of schedule, you will be put to the task of expanding your maximum expectations. In the eighth position: Can things really be going this good? Yes, of course! And there seems to be plenty to go around. Hope you are enjoying every minute as you well deserve it. In the ninth position: You are happy about the state of your emotional affairs, your relationships, and/or your creative projects. Things are probably going well down in the physical plane too. In the tenth position: Here within this next year, physical and material blessings will fall to you. Much will seem as if by chance, but all is part of your karmic purpose unfolding and may bring its share of lessons to be learned. The sun always makes me so happy. Glad I got it as an outcome. Love and light to you. Love the ability and skills of depth and beyond view of the cards meanings. Thanks for sharing!